What type of bunk beds does Affordable Home Furniture offer? 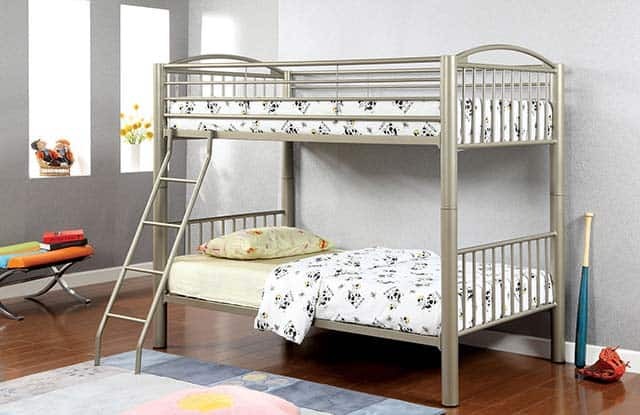 At Affordable Home Furniture in Van Nuys, we carry hundreds of both metal bunk beds and wooden bunk beds in a variety of categories: twin over twin, twin over full, full over full, XL twin over queen, and queen over queen. We also offer loft beds, bunk beds with stairs, L-shaped bunk beds, lofted beds with a desk, and triple bunk beds. What are common bunk bed sizes and dimensions? Bunk bed sizes – length, width, and height – vary by design and manufacturer. 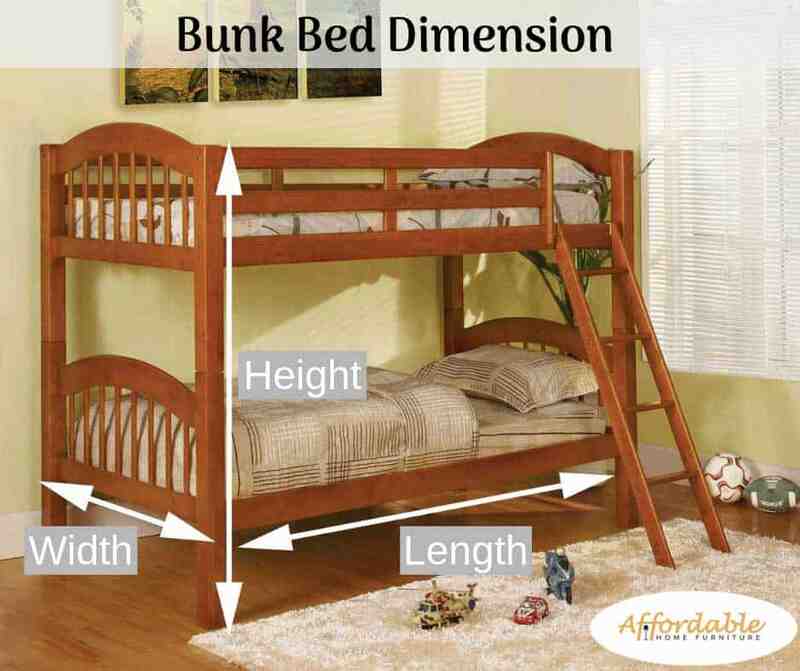 But before considering bunk beds, you should understand their dimensions. When facing a bunk bed, as if about to get into it, its length measures left to right, its width measures front-to-back, and its height measures top to bottom. How much clearance do you need above a bunk bed? This is a question customers often forget to ask in-store but have to consider once they get home. The bunk bed clearance is simply the space between the bottom bunk and the very bottom of the top bunk. The average clearance of a bunk bed is 33”. 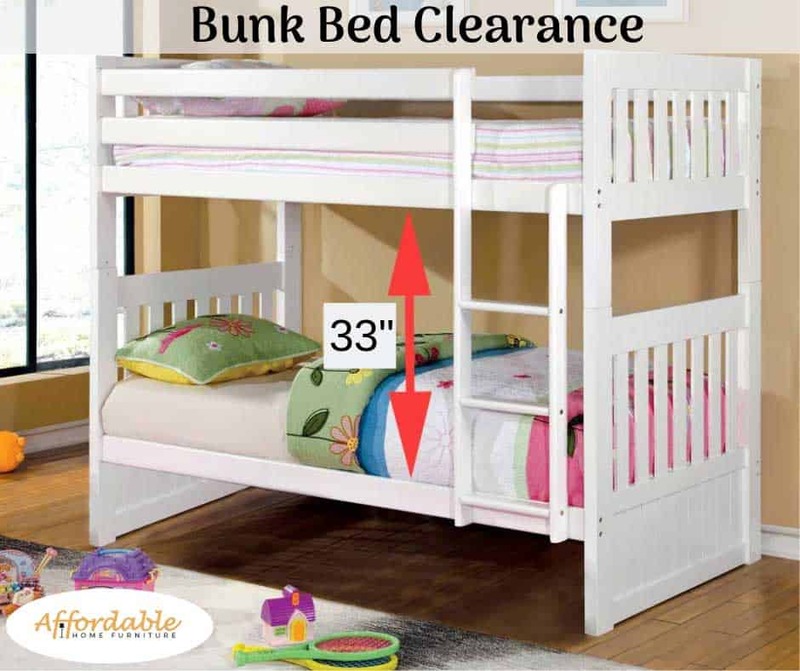 A clearance of 33” allows for an adult to sit upright on the bottom bunk without hitting their head, so typical bunk bed clearance measures between 28” and 38”. The bigger the clearance, the taller the bunk bed; the smaller the clearance, the shorter the bunk bed. Bunk beds with smaller clearance are usually best for smaller kids. 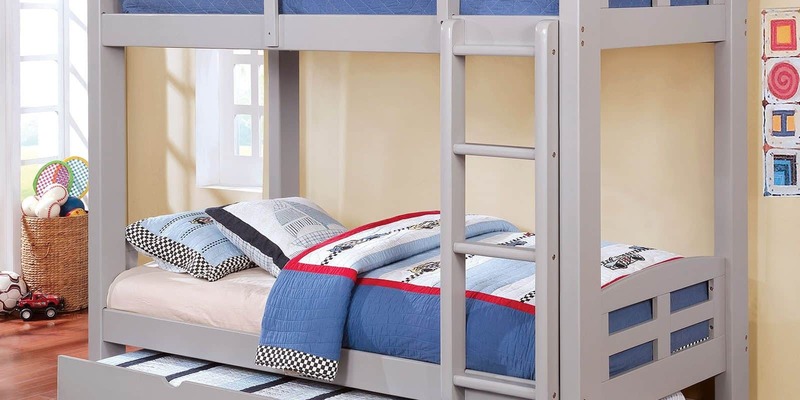 These smaller bunk beds make it ideal for kids to easily get in and out of bed and also keeps the overall height of the bunk bed to a minimum for safety. Bunk beds with taller clearances are usually lofted beds with desks underneath, ideal for a kid or an adult to use for both sleep and work. When selecting a bunk bed ladder, should you choose a straight ladder, angled ladder, or staircase? Bunk beds typically have three different types of ladders to access the top bunk, each with its own pros and cons. The straight ladder is attached to the top and bottom of the bunk bed. 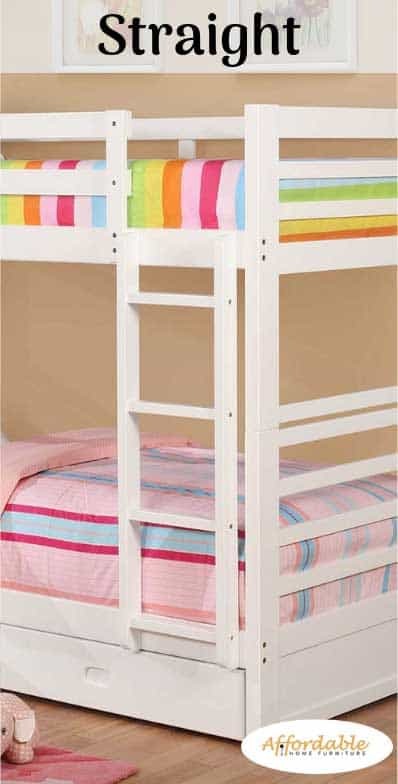 This type of ladder is bolted to the bunk bed and not removable, making it a good option for small kids who might otherwise trip over the ladder. The ladder is also best for a tighter area and saves space in the room. The angled ladder is attached by screws to the top bunk only. The bottom of an angled ladder typically extends 11” away for the bottom bunk. 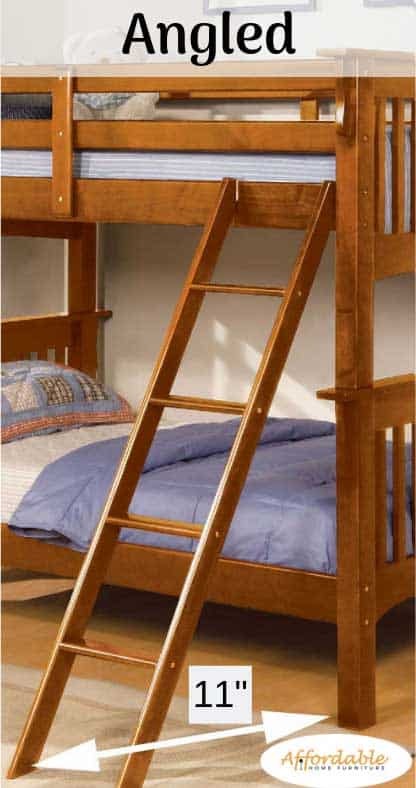 This type of ladder allows an easy climb to the top bunk, making it best suited for older kids. (An angled ladder can become a tripping hazard for younger kids.) In contrast to the straight ladder, an angled ladder is also better suited to larger rooms. Lastly, a staircase ladder is a great option for smaller and younger kids. The staircase ladder offers large steps, handrails, and usually incorporates drawers inside the staircase. 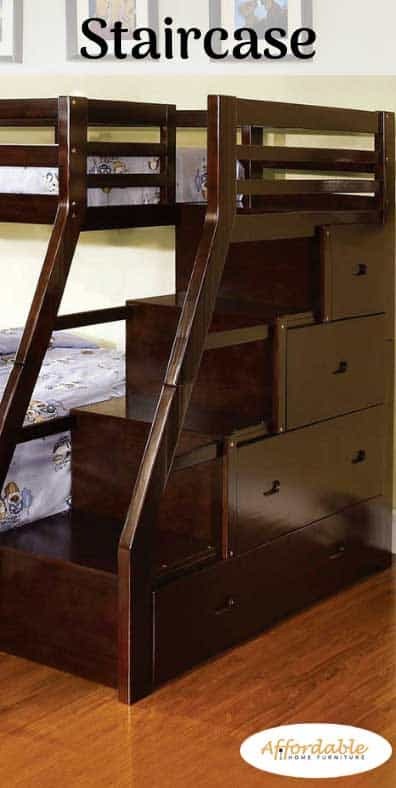 Staircases are usually attached next to the bunk bed, enabling access through the footboard. Staircase bunk beds are therefore longer in length, averaging at around 99” and suited for a larger room. 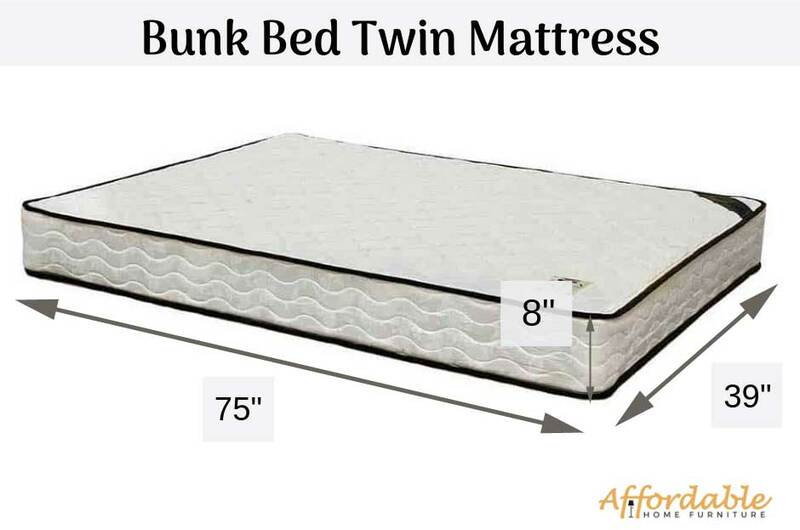 What is the average size of a bunk bed mattress? In many cases, a twin size mattress will fit perfectly on any typical bunk bed. At Affordable Home Furniture, all our manufacturers make bunk beds that accommodate a standard twin mattress. However, we do carry a variety of bunk beds, including those with twin beds on top and twin, full, or queen beds on the bottom. A typical twin over twin bunk bed requires two twin mattresses that measure 39” wide by 75” long. One thing to keep in mind when purchasing a mattress for the top bunk though is mattress height. The best height for a top bunk bed mattress will be anywhere between 5” to 8”. If a bunkie board is used, this will add two more inches to overall height. Do you need a bunkie board for your bunk beds? A bunkie board is required for a bunk bed when there are not enough slats to support the mattress. Bunk beds with eight or fewer slats will require a bunkie board to support the mattress and prevent the slats from breaking. 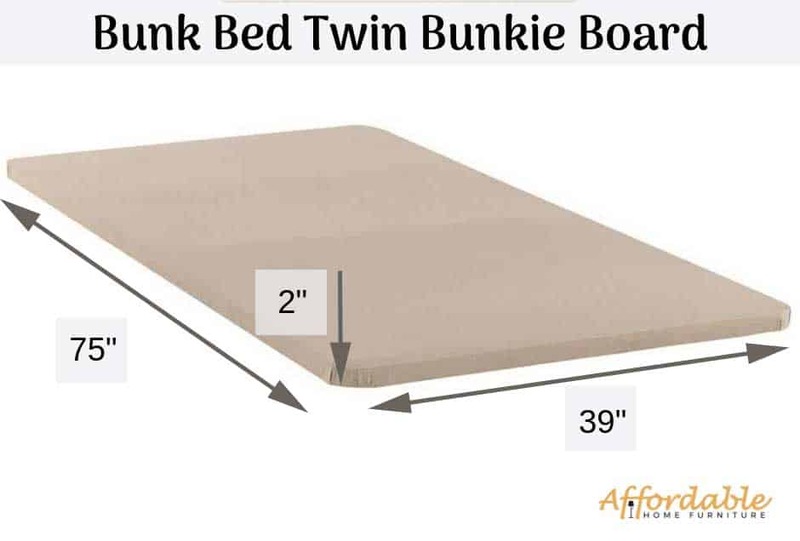 Here at Affordable Home Furniture, we usually recommend bunkie boards when any adult will be sleeping on the bunk bed. 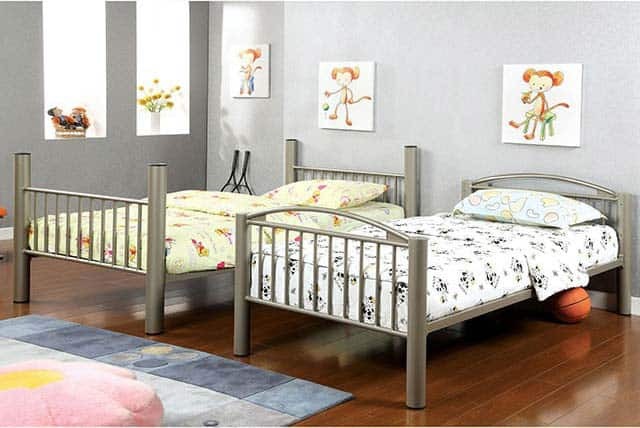 At Affordable Home Furniture, we also carry metal bunk beds that can separate into two twin beds. These types of bunk beds are great for kids to grow into. Starting with two twin beds, as kids become older and more responsible, the twin beds can be stacked on top of each other to become a bunk bed. Bunk beds that separate is also a great option for kids that share a room, as they take up less space and can be fun for children to sleep and play on in either format. Does Affordable Home Furniture offer bunk bed delivery and assembly? Yes, we offer bunk bed deliveries to the San Fernando Valley, Santa Clarita, Simi Valley, and the Los Angeles area. Delivery fees vary by location. In addition to delivery, we also offer bunk bed assembly. Our trained professionals are able to assemble any of the bunk beds listed above. Bunk bed assembly does incur a fee though depending on bunk bed size and difficulty of assembly.